Oral History: 1995, 2 interviews. 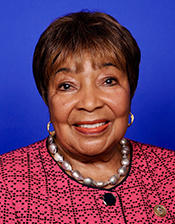 The interviews with Rep. Eddie Bernice Johnson are part of the the Voting Rights Act Oral History Project. The interviews took place on January 20 and 27, 1995. Topics covered include Rep. Eddie Bernice Johnson's rise to political power in the state of Texas and in the United States Congress. She recalls the significance of African American voting for politics in Texas, the significance of the Voting Rights Act, the challenges of redistricting in Texas, the implications of recent Court decisions on the redistrciting process, and the growing strength of the Republican Party in Texas politics. Papers: In the Texas Parks and Wildlife Department Executive Office Records, ca. 1972-1999, 15.24 cubic feet. Persons represented include Eddie Bernice Johnson. Papers: In the National Organization for Women Lubbock Chapter Records, ca. 1967-1978, 1,985 leaves. Correspondents include Eddie Bernice Johnson. Oral History: August 3, 13, and October 2, 1973; 232 pages. In the interview with Eddie Bernice Johnson, nurse and Democratic member of the Texas House of Representatives from Dallas, she discusses her experiences and personal views as a member of the Sixty-third Legislature. She also talks about her early life in a segregated society, her early political activities, her campaign for the Texas House of Representatives in 1972, the Black Caucus, the Women's Caucus, reform legislation, appropriations, personal legislation, her altercation with Comptroller Robert Calvert, and her comments on Governor Dolph Briscoe. Oral History: September 10 and December 1, 1975; 71 pages. In the interview, Eddie Bernice Johnson, nurse and Democratic member of the Texas House of Representatives from Dallas, discusses her experiences and personal views as a member of the Sixty-fourth Legislature. She also talks about the House speakership race, committee appointments, public school financing, constitutional revision, public utilities legislation, personal legislation, and Governor Dolph Briscoe. Papers and Audiocassette: 1991, 2 items. An audiocassette with a transcript of a speech delivered by Texas States Senator Eddie Bernice Johnson to the American Nurses Association, 1991, at the Allio [?] Plaza Hotel in Kansas City, Missouri and concern support for nursing and health care reform. Papers: In the Lawrence C. Pope Collection, 1961-1989, 90 feet. Persons represented include Eddie Bernice Johnson. Papers: In the papers of Ruthe Winegarten, 1912-2004, 108 feet, 2 inches. Collection includes research file on Eddie Bernice Johnson. Papers: In the Women in Texas Government Exhibit collection, 1931-1995, 1 linear foot (100 items). Persons represented include Eddie Bernice Johnson. Papers: In the records of the Washington Office on Africa, Addendum B, 1970-1996, 35 linear feet. Persons represented include Eddie Bernice Johnson. "Eddie Bernice Johnson" in Black Americans in Congress, 1870-2007. Prepared under the direction of the Committee on House Administration by the Office of History & Preservation, U. S. House of Representatives. Washington: Government Printing Office, 2008. "Eddie Bernice Johnson" in Women in Congress, 1917-2006. Prepared under the direction of the Committee on House Administration by the Office of History & Preservation, U. S. House of Representatives. Washington: Government Printing Office, 2006.